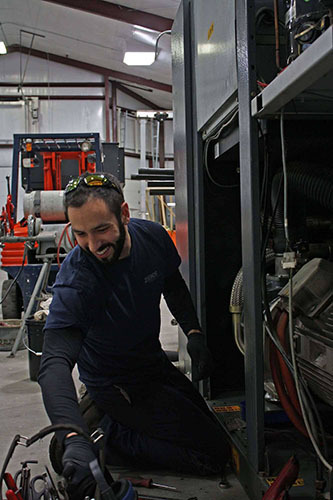 The final phase of our 4-part air compressor system service is system maintenance. You have put a lot of time and effort into making sure you have the best possible air compressor system and allowing us to help you design, fabricate and install your system. The finishing touch is to let us help you take the best possible care of that system with our comprehensive system maintenance. What Is the Purpose of Our System Maintenance Service? The purpose of our preventative maintenance service is to make sure your air compressor system is working at optimal efficiency as often as possible for as long as possible. Our maintenance services involve a thorough analysis of all the parts of your system to make sure they are in top shape at all times. How Does Our Air Compressor Maintenance Service Help Businesses? Air compressors, like all machines, have moving parts — and moving parts eventually wear down. By scheduling regular preventative maintenance, you allow us to identify any parts that may be in danger of breaking down so we can replace them before that happens. We can also spot any potential issues before they become huge repair problems down the road. What Are the Benefits of Preventative Maintenance for Compression Systems? Scheduling preventative maintenance rather than waiting for something to go wrong allows you to be proactive with your air compressor system. The most important benefit of this is reducing downtime. Allowing us to fix a problem we uncover during maintenance will take your machine offline for a much shorter time and with much less disruption than if your machine suddenly dies on the line because a part has worn out or you left a repair issue unattended. Our maintenance can also reduce wear on your system, meaning your equipment can last longer before needing replacement. If we have sold you your equipment, installed it for you, and designed your plan, who better to maintain your system and make sure it is running properly? Even if you already have a system in place, you can be confident that our maintenance experts can keep it running in top form. Why Choose The Titus Company for Preventative Air System Maintenance? The Titus Company offers periodic scheduled maintenance at affordable rates and can schedule our visits for your convenience. We have a team of highly trained professionals with years of expertise installing and maintaining compressed air equipment. There is no better group of professionals to entrust with the care of your air compressors and associated equipment. You have taken the time to design the best possible air compressor system for the success of your business. Now, be sure to protect your air compressor system with proper maintenance. Contact us today to set up your maintenance plan.